You and your wife operate as a team, but when she takes an extended vacation, you suddenly have to take care of the kids all by yourself. Take a deep breath and realize that a weekend without mom is a great opportunity for you to bond with your kids like never before. 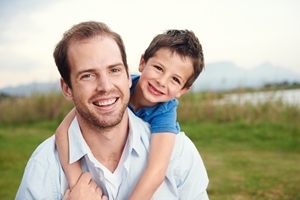 Check out these three things all fathers should do with their kids when mom's out of town. Cook together: If your wife does most of the cooking, step behind the grill or oven and show your kids you know a thing or two. Don't be afraid to get a little messy with the ingredients of whatever you choose to make – the more fun the cooking, the tastier the meal! Roughhouse in the yard: Your kids have plenty of energy, so let off some steam with them in the backyard. Pretend and make believe with your kids and odds are they'll remember "That weekend Mom went away" for the rest of their lives. Watch your favorite movie: Everybody has that one movie they love to hate, and picking one film for family movie night might seem impossible. If you and your kids share a love for a cheesy comedy or action movie that mom hates, pop it into the DVD players while she's out of town so you can enjoy it with your kids.